Subaru Australia has launched The Show, a TV advertisement for the new generation Impreza featuring a visual extravaganza accompanied by the music of Iggy Pop and Peaches. 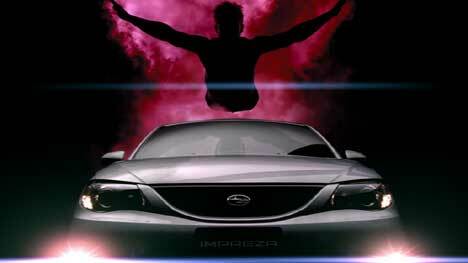 Male and female models gyrate over a Subaru Impreza, enveloped in magenta smoke. The Subaru Show ad was developed at Leo Burnett, Sydney, by creative director Mark Collis, creatives Stephen Coll and Kieran Antill, and agency producer Adrian Shapiro. Filming was directed by Nick Robertson via Plaza Films with producer Kim Kirby and director of photography Daniel Ardilley. Nick shot the people using a combination of 1000 frames per second on the slo-mo extreme camera in a studio and underwater footage filmed at the Olympic Dive pool in Sydney. The magenta smoke effect was developed by injecting pink ink into a cloud chamber. Editor was Danny Tait at The Tait Gallery. Post production was done at Animal Logic by VFX supervisor / Flame artist Angus Wilson and post art director Ben Walsh. Sound was designed at Nylon Studios. How do you do a cool dance? I don’t look too good in pink. You gotta handle that stuff. Kick it, kick it, kick it! Ah go f**k your pain away! What is it? Acid, limo or some kind of toy?